The common bedbug is an insect that feeds on human blood. They are often found near sleeping areas in the seams of mattresses, box springs, cracks and crevices in bed frames, and usually spread to gaps behind baseboards, pictures, wallpaper and electrical outlets. They may hitchhike into a home on used furniture, clothing or other items brought from infested areas. Try not to be alarmed if you find out that you have a bedbug bite. 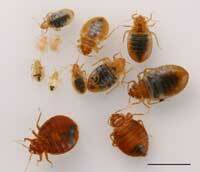 Bedbugs are not known to carry diseases, even though allergic reactions are possible. If you have bedbugs, with help, you can eliminate them for good; but the best thing to do is be vigilant in prevention. There is no magic bullet to use against bedbugs. Once you have identified a bedbug infestation, you will probably require the help of a professional. In order to prevent the spreading of bedbugs to other areas, do not remove any bedding or other items to another room in an effort to relieve yourself of the problem. This may very well cause the spread of the problem to another area. Do not share clothing or other items that have been in the room with other people. Until the problem is identified and solved, all precautions should be taken to insure that the problem remains isolated so it may be adequately treated and solved. It normally takes months for a severe infestation to spread to other rooms within the same general area. The probability that it has spread is very minimal. The pest control technicians will be able to evaluate the situation and determine if there is any indication that additional inspection and/or treatment is necessary. Our treatment plan for the infestation is to perform all treatments with the safety of the resident as the primary concern. We also want to make sure that we have eliminated the problem, but in a safe manner.